Preheat the oven to 475 degrees C (220 degrees C). 2.Roll out pizza crust and place on a pizza pan or baking sheet. Spread a thin layer of hummus over the crust. 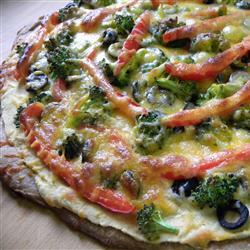 Arrange sliced peppers and broccoli over the hummus, and top with shredded cheese.3.Bake for 10 to 15 minutes in the preheated oven, until the crust is golden brown and cheese is melted in the center. Slice and serve. To add some meat to this pie I would add some Black Label Bacon or some Hormel chicken breast. Both are simple and quick to add. What is your favorite way to eat hummus? I would love some ideas and if you have a recipe you would like to share just let me know I would love to feature you.